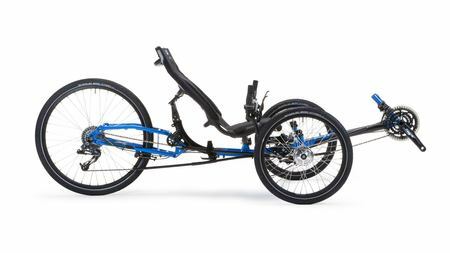 The Azub Ti-Fly is a full suspension Trike with a supple ride. It won Trike of the Year for 2016 with its Titanium front suspension and rear shock. With multiple colors, gearing options, and brake options, please see the pricing spreadsheet for up-to-date detailed prices at http://www.azub.eu. 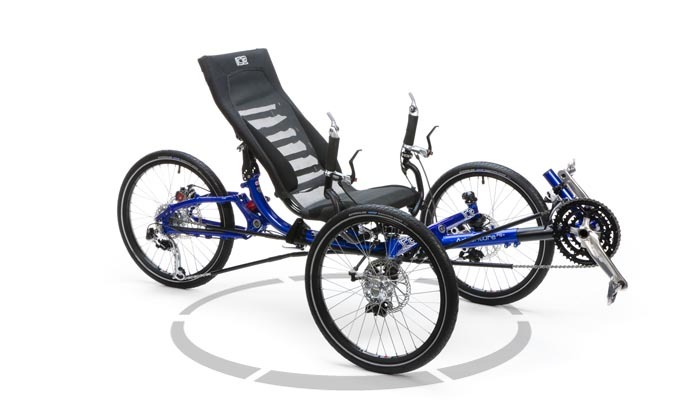 Azub TRICON has the ideal positioning system where the individuals can dial in the trike to fit them. Azub has a wide range of options for their trikes. The TRICON has rear suspension to take the bumps out of the ride. With the 26" rear wheel, this Azub gives you greater stability, comfort, and slightly rolling resistance. The TRICON comes with a 157 mm Syntace X-12 solid axle with the normal external gearing. Other gearing options such as Alfine, Dual Drive, or Rohloff comes with 135mm spacing. To view full range of specifications for the TRICON click here. 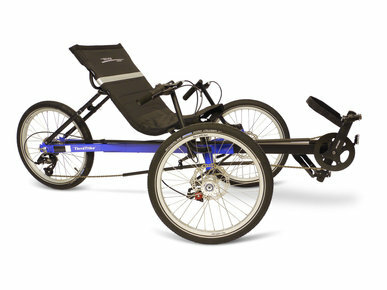 The Catrike 5.5.9 is a folding model which allows for easier transportation. Close in feel to the popular Expedition, it is a little higher with an adjustable seat. 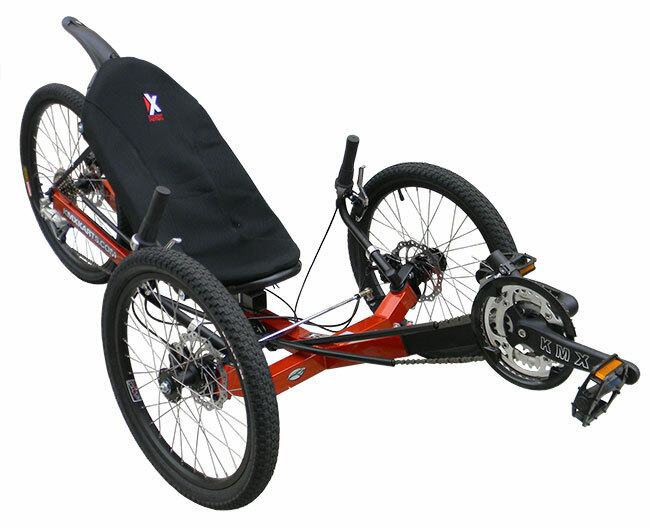 The extra seat pad makes it one of the most comfortable trikes on the market. For complete specs on the manufacturer's website click HERE. 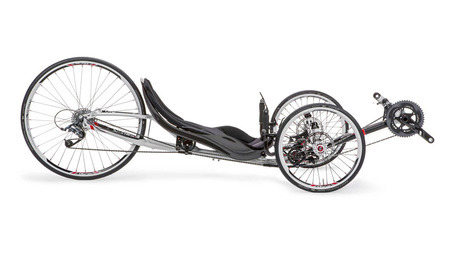 The Catrike 700 is a lightweight fast machine for those who wish to have the ultimate in performance. Sporting an Aluminum frame and Sram drivetrain, it can move as fast as you need. The 25 degree seat layback allows the pilot to cut through the wind with minimal drag. For complete specs on the manufacturer's website click HERE. 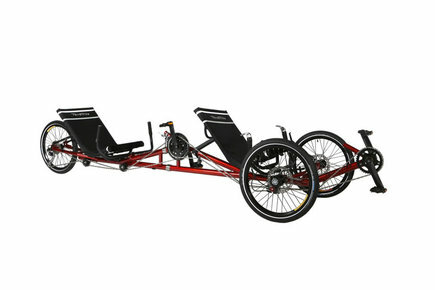 The Catrike Villager has been a popular model with those who would like a higher seat entry/exit. In addition to the higher seat, we have modified a number of these with 24 inch front and 26 inch rear wheel to make it even higher. The wider track allows for a more stable ride. 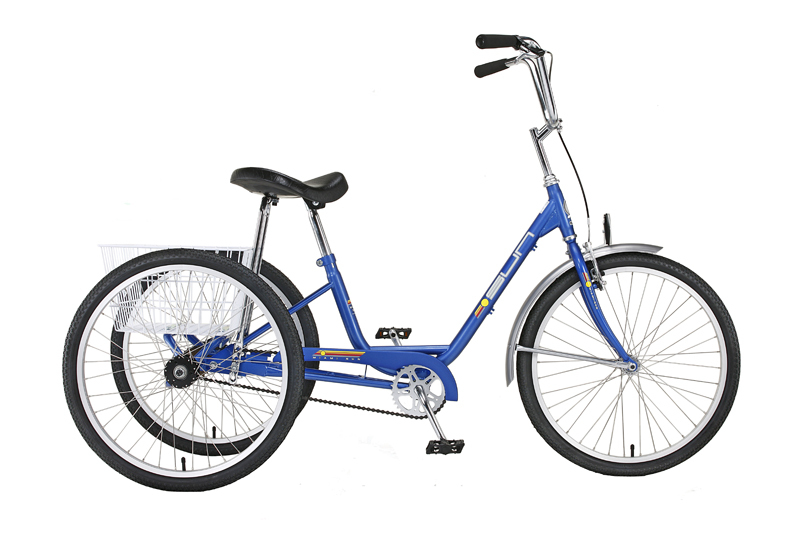 The standard premium shifting and braking components round out a solid performing Trike! For current specs at the manufacturer's website please click HERE. 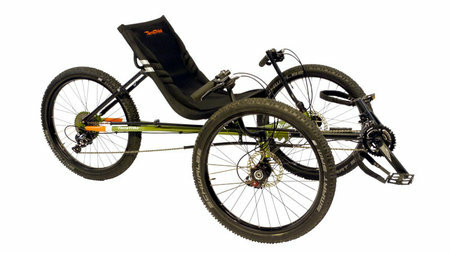 The Catrike Expedition has been a favorite of Trike riders for years. It is designed for the long haul, and it adeptly traverses hard surface roads and crushed lime trails with ease. It sports a 26" rear wheel for a longer and more comfortable wheelbase as well as a higher gearing translated into higher speeds. The standard Catrike neckrest is included as are the comfortable wristrests. 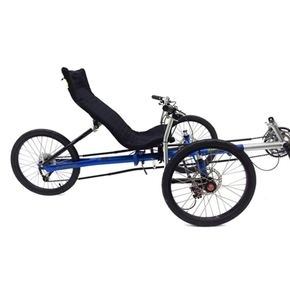 For the complete specifications at the Catrike website click HERE. The Catrike Dumont has comfort being fully suspended. 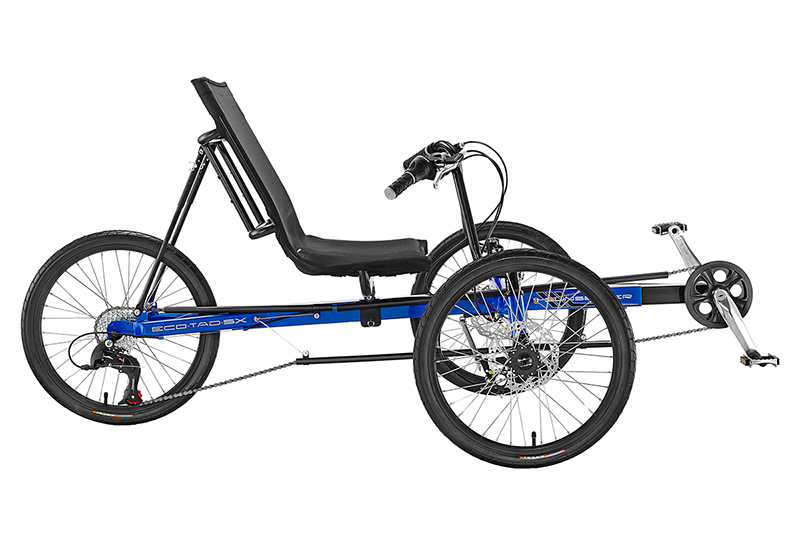 This Catrike can move down the road with a 26" rear wheel and 30 speeds. 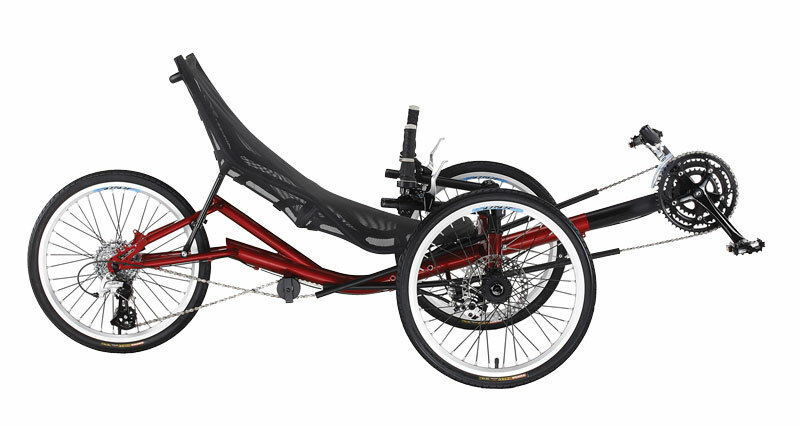 You can cruise in style with Catrike's graceful design. The Dumont folds for easier transporting. You can view the Dumont's full specs here. 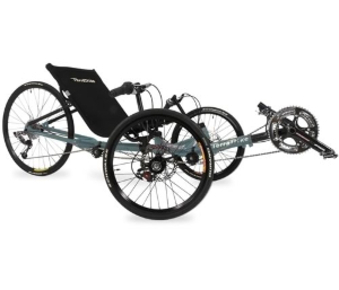 The Catrike Trail transitioned into a folding model, and at $2750 has a premium drivetrain in the Sram components. With the lightweight Aluminum frame and powdercoat paint, it is a work of beauty. The adjustable seat back allows for multiple positions to dial in the comfort for the best fit. For current specs on the Trail at the manufacturer's website HERE. 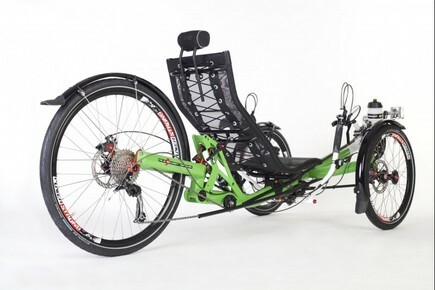 The newly redesigned Catrike 700 features a taller seat back for more comfort, and the engineers at Catrike have added an FSA Hollow Carbon Crank along with a Zipp Course 30 Thru-Axle Disc wheel for increased stability in turns. 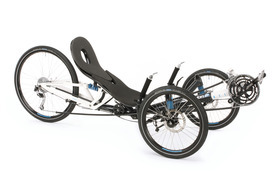 The Catrike 700 is designed to be fast an efficient. For a complete listing of specifications see HERE. This Cat is sporty, supple, and comfortable. The road-AR offers an rear adjustable air shock with anti-dive patent-pending front suspension without being excessively bulky or weighty. The road-AR offers an adjustable padded seat so that you can ride many miles in comfort. As this Catrike offers a rear fender, wrist rests, mirror, and clipless pedals common to all Catrikes, the road-AR is a great trike. To view the full manufacture's specifications click Here. The Road has SRAM bar-end shifters with 30 speeds so you can choose the right gear for a variety of different terrains. 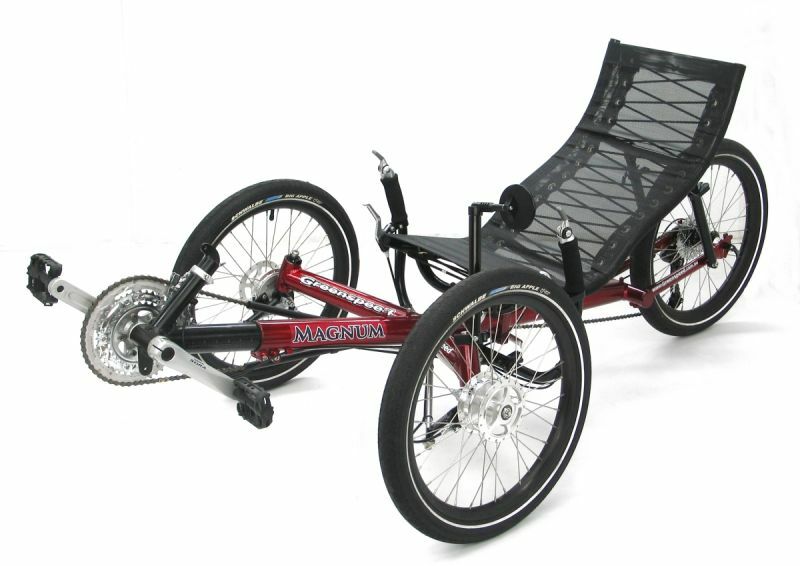 This trike has a padded seat with angle adjustment and a RockShox Monarch Air Suspension you can ride in comfort. 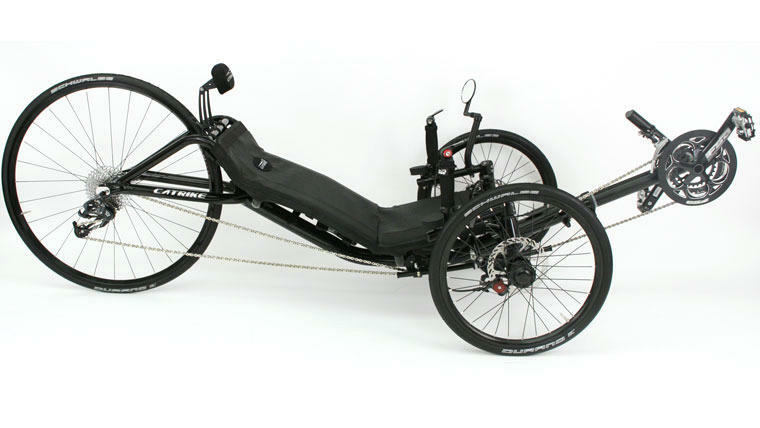 This Catrike has a mirror, platform/clipless pedals, and rear fender already installed. A rear rack, front fenders, neck rest, etc. are some of the accessories that you can mount onto this trike. The Catrike Pocket is designed for the smaller rider, with a frame is just right for touring on trail or road. It is also the easiest of the Catrikes on the pocketbook! For the current specs on the Pocket click HERE. The GT20 is a new Greenspeed model. The GT20 from touring to just leisurely rides is a great all around trike. 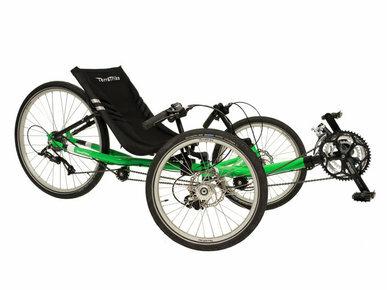 This trike as well as all the other Greenspeed models have the new rectangular main tubing. The rectangular tubing gives the GT more durability and weight saving. The steering is smooth, very precise, and tight turning. A wonderful ride. For complete specs on the manufacturer's website click Here. GT1 is a Series 1 2012 model. This trike comes with Shimano Nexus 8 speed Internal hub. With three 16" (349) wheels is more compact that the Magnum. It folds down to compact size for transportation and storage capabilities. With single cog in the rear and single chain ring in the front chain line does not change. This trike is for commuters. The rider weight capacity is 265lbs. Some specs are different from the Series I to Series II. To see the spec of the new Series II GT1 click Here. 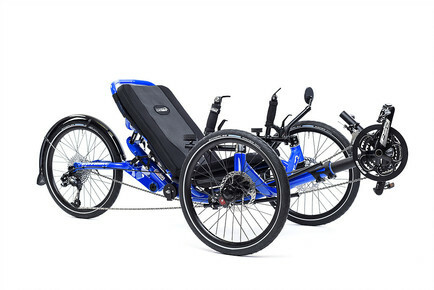 The GT3 Series II is a small trike with lots of benefits. 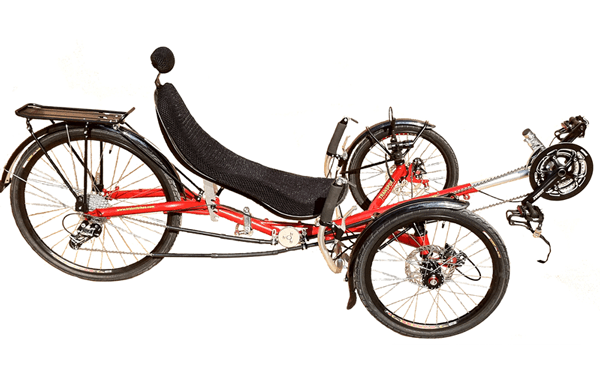 This trike with 349/16" wheels is more compact than other trikes. Easily fold-able with just 6mm allen key for transporting it in a car and takes up less space for storage. GT3 has 27 speeds to give a broad range of gears. Has 100 psi tires for fast rolling rides. X-Seam Range: 41" - 49"
The Greenspeed Magnum boasts a payload capacity of 400 lbs, and with its Aluminum frame it won't break your back lifting it for transport. In addition, the seat has multiple adjustments, both up and down as well as the back tilting to the angle you need. The lumbar support is also a nice feature. To top it off, the Magnum folds for easy transportation. For complete specs on the manufacturer's website click HERE. The Aero is for those riders who want that need for speed. The Aero is sleek, fast, and innovative. The joystick steering allows the rider to be closer to the ground as well as being precise and agile. The low profile of the 16" front/ 20" rear wheels and the reclined seat position of the Aero reduces air drag adding to the speed. The light weight 7005 aluminum frame as well as the GreenSpeed Scorcher tires helps to go fast. For complete specs on the manufacturer's website click Here. 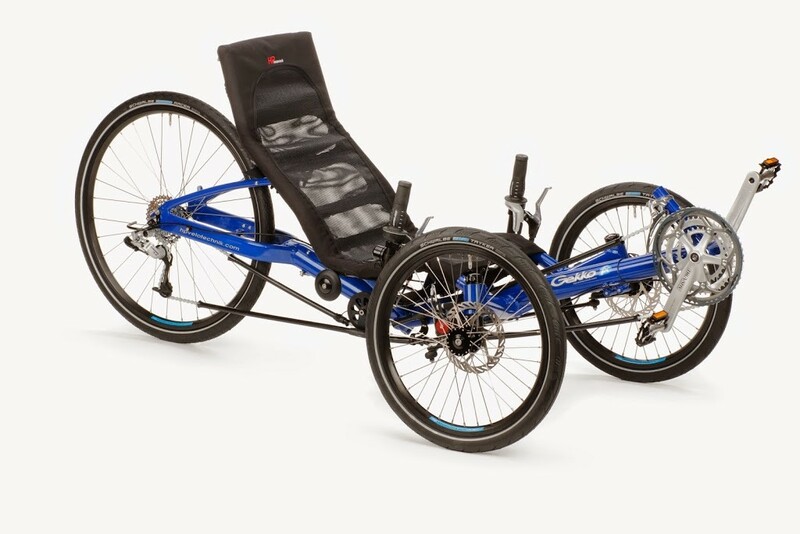 The HP Velotechnik Gekko fx26 USA is new for 2015, featuring a 26" rear wheel while maintaining the quickest folding time of all Trikes, bar none. The drivetrain features a 24 speed derailleur system coupled with twist grip shifters. We can also customize your Gekko with bar-end shifting if desired! The Gekko is a solid performer as one would expect from HP Velotechnik. For complete specs on the manufacturer's website please click HERE. The HP Velotechnik Scorpion fs26 has one of the smoothest rides of all Trikes. It features both front and rear suspension that is adjustable to body weight. In addition, it has multiple seat choices to best fit your body size. 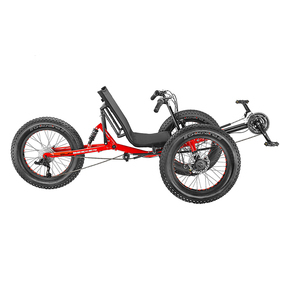 Add to that the premium Aluminum frame and Sram drivetrain, including the Sram Dualdrive rear hub with its internal 3 speed drive in combination with an 8 speed external drive, and the trike is well worth the price. In addition, it even folds! For complete specs on the manufacturer's website please click HERE. 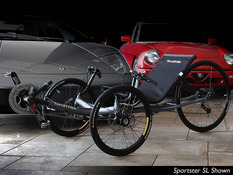 The HP Velotechnik Scorpion fs26 S-Pedelec has all the features of the standard Scorpion fs26, but adds the Go-Swiss 500 Watt motor for assistance both on the flat and up the hill! With the tuned suspension, this ride is exquisite! See all the cool specs on the HP Velotechnik web page HERE. 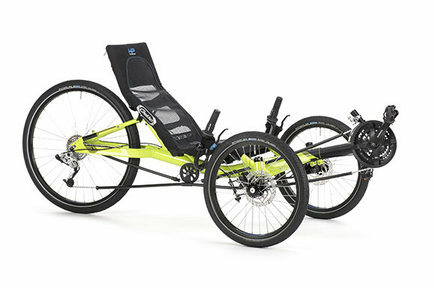 The HP Velotechnik Scorpion fx features a folding frame and a rear shock. It offers multiple seat options that vary in height from 13-3/4" to 15" to 18". The standard Sram Dual Drive rear hub coupled to an 8-speed rear drivetrain allows a wide range of gears, even allowing shifting while parked, pedaling, or coasting. German engineering shows its quality in all the mechanics of the Scorpion fx! See all the specs on the manufacturer's web page HERE. The HP Velotechnik Scorpion Plus 20 Pedelec has all the features wrapped up into a single package. It features full shocks- both front and rear wheels and a GoSwiss Electric Drive. The seat is higher than any other standard tadpole Trike on the market, so entry and exit is as simple as sitting down or standing up. See all the options and specs on the manufacturers website HERE. Scorpion plus 26 is the more big brother version of the Scorpion fs 26. This HP has plush suspension that the rest of the Scorpion fs have. This Scorpion is higher off the ground for easier entrance and exit. Since this HP has a higher center of gravity, they widened the track width for stability purposes. For full specifications, view the manufacturer's website by clicking, Here. This HP Velotechnik Gekko is new and made for the US only. This Gekko is non-folding, which brought the price point down. There are two different configurations which you can choose from. The Sport is more economical and the Performance is more refined. Even though the price point has been lowered the quality of this HP has not been compromised. To view the manufacturer's full specs click Here. The ICE VTX is for those cyclists who like to go fast. The frame is made of Cromoly Steel and Aluminum so that you get the little bit softer ride of the Steel but then the better power transfer of the Aluminum. The VTX has the 700c rear wheel plus high pressure tires so you can speed down the road or trail. This trike has the looks as well as the performance. To view all the specifications of the VTX click Here. The ICE Adventure HD is designed for riders who want a larger, sturdier frame compared to the standard Adventure. The seat width is 17.5", and the weight limit is a robust 325 lbs. The ability to fold makes transportation a breeze. See all the specs and options on the manufacturer's website HERE. The ICE Adventure RS is for the rider that wants the comfort of rear suspension . This trike has an upright position for those relaxed trail rides. The Adventure with the 26" wheel can roll quicker than the 20" version. Also the 26" wheel extends out the wheel base and soaks up more bumps. With the ability to fold makes this trike easier to transport. The KMX Cobra is the "BMX" of Trikes. Its sturdy construction and added rear disc brake along with its lower center of gravity make it a pleasure to run through the paces on- or off-road. The Sun Eurus sports an Aluminum frame for lighter weight. It comes standard with a Dual Drive rear hub, which simplifies shifting. Just pick the range from the rear hub (easy, normal, fast), and then shift with the standard twist shifter for a choice of 8 speeds. It sports a very comfortable seat, and the cambered wheels allow for faster cornering. To see the specs on the SunSeeker website click HERE and the click on the Eurus icon. 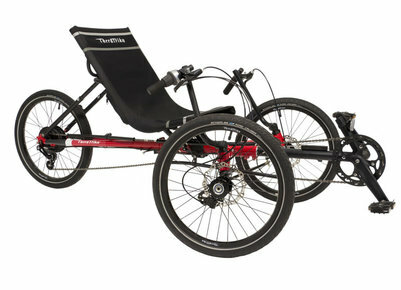 The Sun T3 CX is designed to be a sporty version of the Sun tadpole Trikes. Its sling seat reminds one of riding in a hammock. The shifting is easy and the brakes stop on a dime. The price is economical for a Trike. Check out the specs at the SunSeeker website. Click HERE and then on the T3 CX Tadpole icon. The Sun Seeker Fat Tad is in a class by itself. With 20" x 4" tires all around, it can go over any terrain reasonable... grass, mud, packed trails, hard surface roads, etc. It sports a Chromoly Steel frame with both front and rear suspension, 24 speeds, and fully adjustable for riders from 37"- 50.5" X-Seam. This is perfect for those of you who like to ride on the farm, gravel roads, and anywhere other Trikes can't quite roll! We have found that an electric assist makes this the perfect commuting Trike. It's a blast! Electric assist kit will run $1999 installed and ready to ride with a 750 watt motor and 11.6 ah battery. Stop by for a test ride on our demo model! 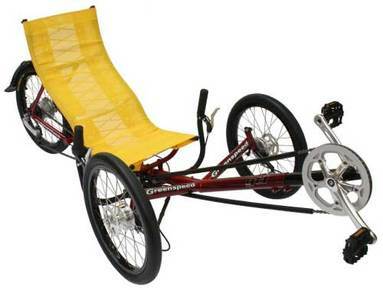 The Sun Traditional Trike is just like you remember your grandparents riding! The basic model has 1 speed with a front caliper brake. The rear basket is standard equipment. Either a 3-speed or a 5-speed shifting system can be added in order to climb hills easier. Added cost is $179.95 and $199.95, respectively. 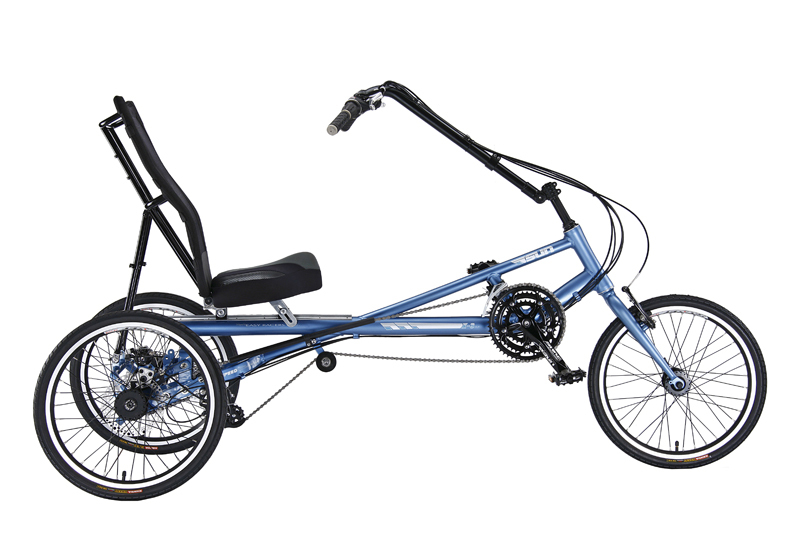 The EZ TriClassic SX is an economical, entry level trike. The trike has an comfortable seat that Sun makes. 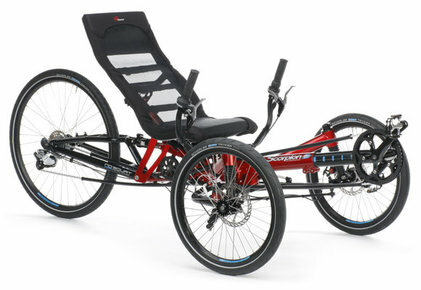 This Sun trike has 21 speeds with a SRAM Gripshift shifters to traverse a variety of terrains. 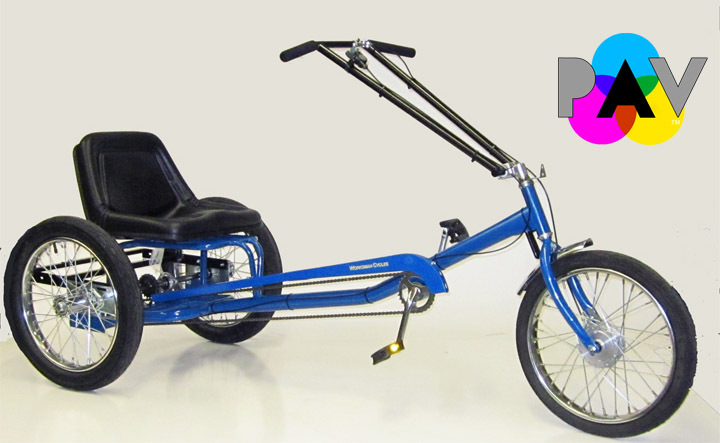 This Sun trike can accommodate riders with a X-Seam length of 32" - 48". 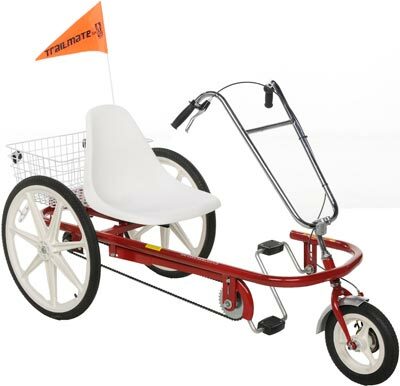 Has a high seat height of 22" for ease of entering and exiting the trike. The Sun Seeker Eco-Tad SX is the lowest priced tadpole that we stock. It comes in 3 colors- Red, Blue, and Navy. It offers 7-speed gearing and a very comfortable seat. It fits folks from around 5 feet tall to around 6 feet 6 inches. This is a very good Trike for the economy-minded. For complete specs on the manufacturer's website please click HERE and then on the Eco-Tad icon. 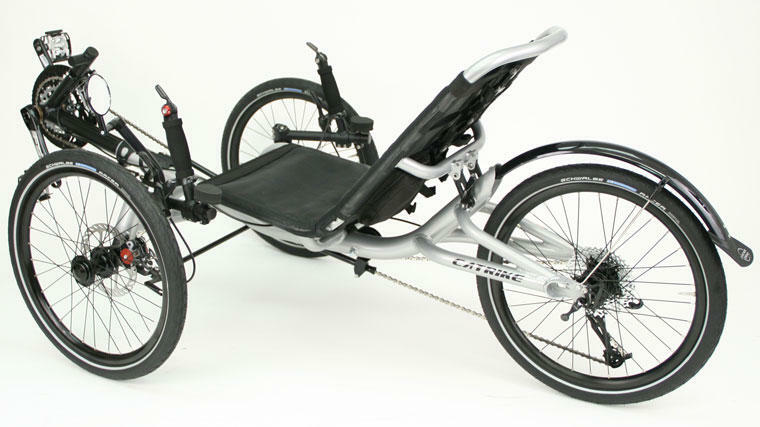 The Sun EZ-3 USX HD model is designed to be a comfortable ride, even for those who may have some extra weight. The under-seat steering allows the rider's arms to relax while pedaling in comfort. It has a wide range of gears to allow for slow speeds going up a hill to fast speeds for on the flat and downhill. The suspension in the middle of the Trike adds to the comfort. For all the specs please see the SunSeeker web page by clicking HERE and then on the EZ-3 USX HD icon. The TerraTrike Rover External 8 is the best for one's budget. At $1199, it is a great value! It has all the features of the Internal 8, but at $300 less. The rider size can be anywhere from 5'0" to 6'6", and the seat back adapts to the position necessary. Please click HERE for complete specs on the manufacturer's website, and then on the "specifications" tab. The TerraTrike Tour II Base is the newest model of the ever-popular TerraTrike that has been popular for the past 15+ years. 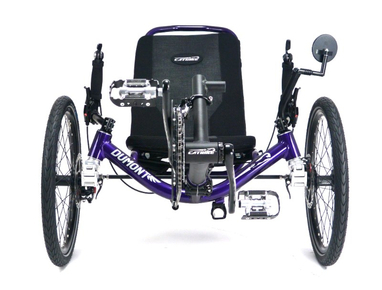 It's Chromoly frame, adjustable seat, and solid performing twist shift gears make it a good value. For those who want to have higher, faster gears, a conversion to a 26" wheel is available as an option. For complete specs on the manufacturer's website please click HERE and then on the "specifications" tab. 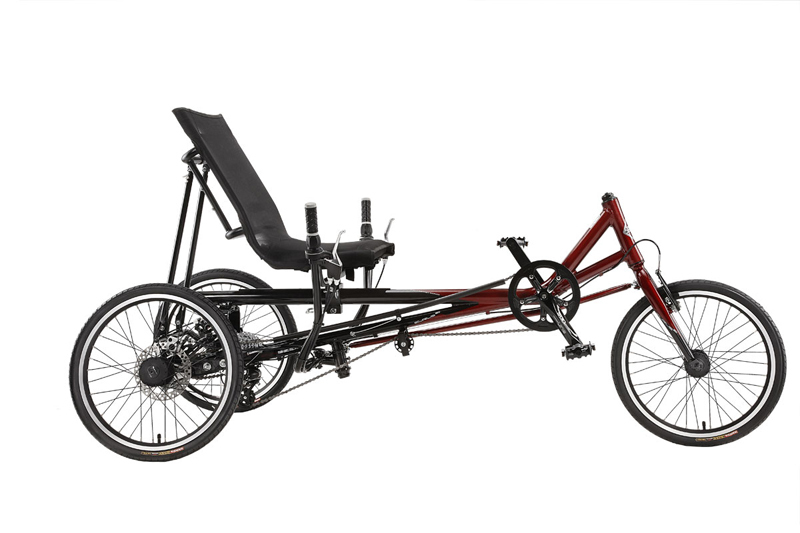 The TerraTrike Tandem Pro Standard model is one of the few premium tandem Trikes on the market. The frame and components are a quality to make short or long rides a breeze. Numerous TerraTrike Tandems that we have sold have made their way across the State of Iowa on RAGBRAI, attesting to the quality and workmanship. With various boom sizes, we can fit most folks in both the Captain and Stoker positions. In addition to the premium parts, the frame has S & S Couplers that allow the frame to break into two 5-foot sections for easier transportation. For complete specs on the manufacturer's website please click HERE and then on the "specifications" tab. The Rambler Internal 8 allows for enough gears to climb most hills, and also protects the gears from most elements such as rain, snow, etc. The Rambler seat and boom adjust to folks from under 5' to over 6'6" tall, and the seat back adjusts to different angles to also fit most folks. For complete specs on the manufacturer's website please click HERE and then on the "specifications" tab. The Rambler All-Terrain makes it possible to go down the road as well as riding off-road. 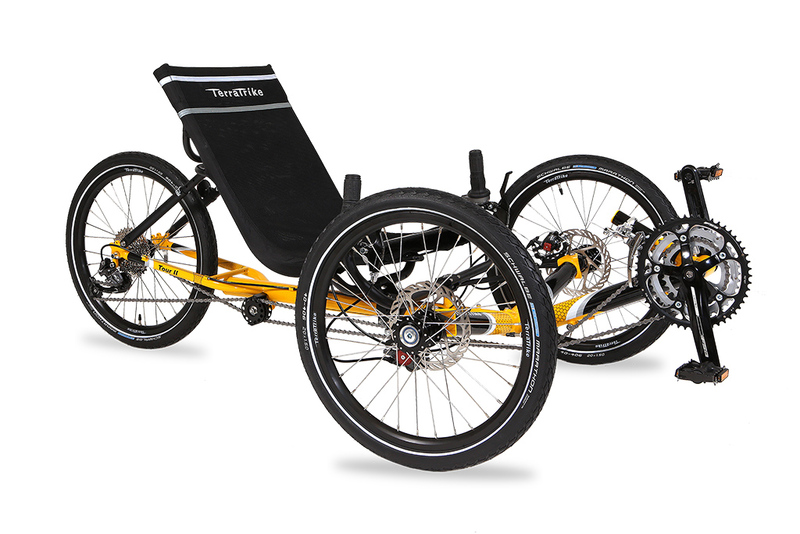 The TerraTrike Rambler AT comes with 24" wheels all the way around. This makes this trike easier to get in and out of, as well making it easier to roll through the unbeaten places. 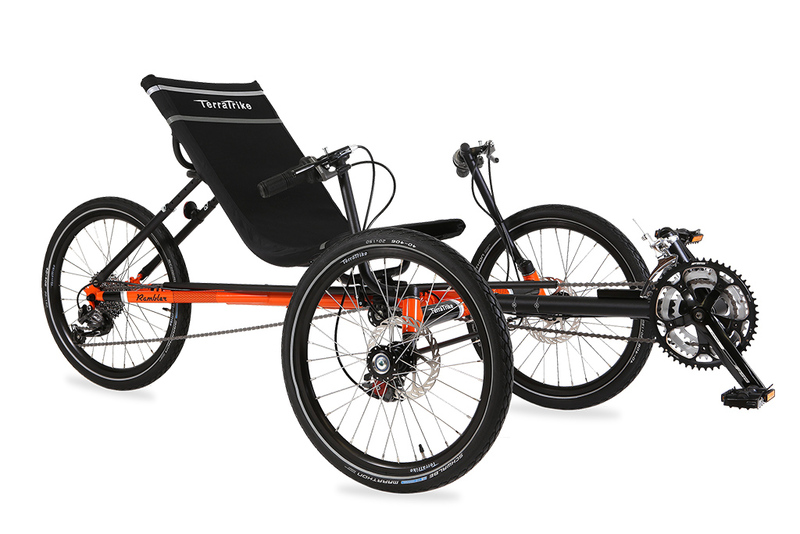 Terra Trike also offers racks and panniers so that the adventure rider can outfit their trike to take their gear with them where ever they roam. Click Here to see the full specs of the AT Rambler. 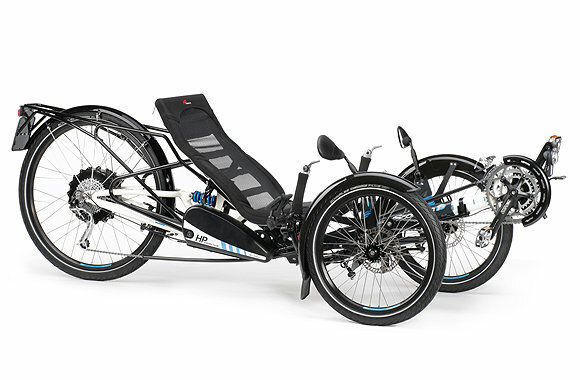 The TerraTrike Rover Tandem allows for double the fun for 2 riders. Its robust frame, 8 speeds, and highly adjustable frame make it a pleasure for all sizes of riders and over varied terrain. 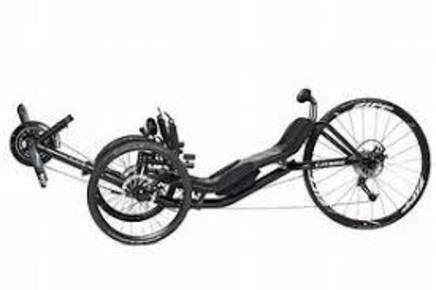 An optional "Independent Pedaling System" (an upcharge of $300) allows for one or both riders to pedal or rest independent of one another. For complete specifications on the manufacturer's website please click HERE and then on the "specifications" tab. The Rambler n380 is just like the Base version but with an upgraded internal Hub. This Rambler gives a a 380% gear range from the NuVinci hub. The smooth twist of the CVT shifter makes it effortless as well as nice and simple. For complete specs on the manufacturer's website, please click Here. 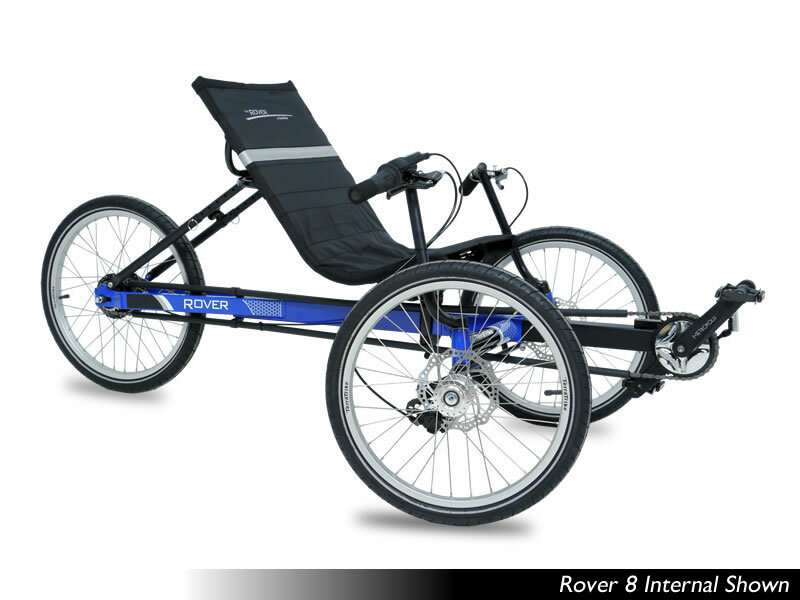 The TerraTrike Rover Internal 8 with its in-hub gearing allows for shifting either on-the-fly or even parked. This makes for a very user-friendly shifting for those who are intimidated by regular bicycle shifting. The internal gearing also protects the trike from adverse elements such as rain and mud which can clutter up gearing that is external. Rounding out the qualities of the Rover is the 400 lb. weight capacity and solid performing disc brakes. 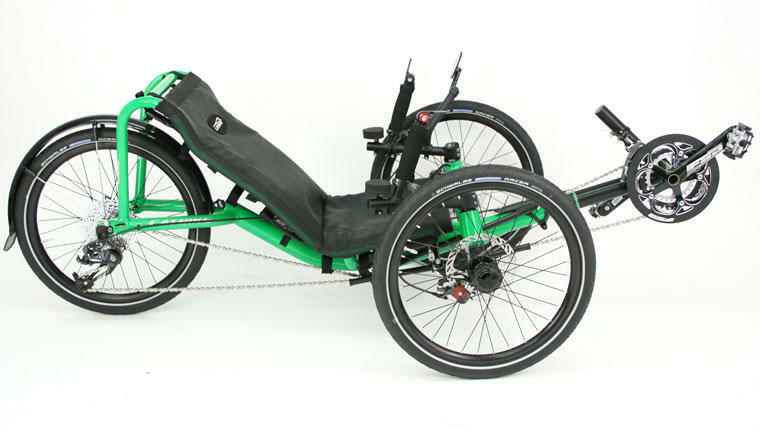 The TerraTrike Rambler is an upgrade from the Rover, and loses 5 pounds of added weight. The Base model works wonderfully going up steeper hills, and the handlebars are comfortably similar to a mountain bike bar. For complete specs on the manufacturer's website, please click HERE and then on the "specifications" tab. 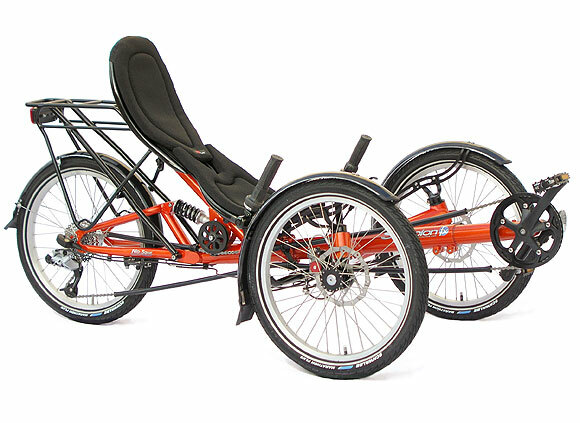 The TerraTrike Traveler GT is the sportscar of the folding TerraTrike Trikes! 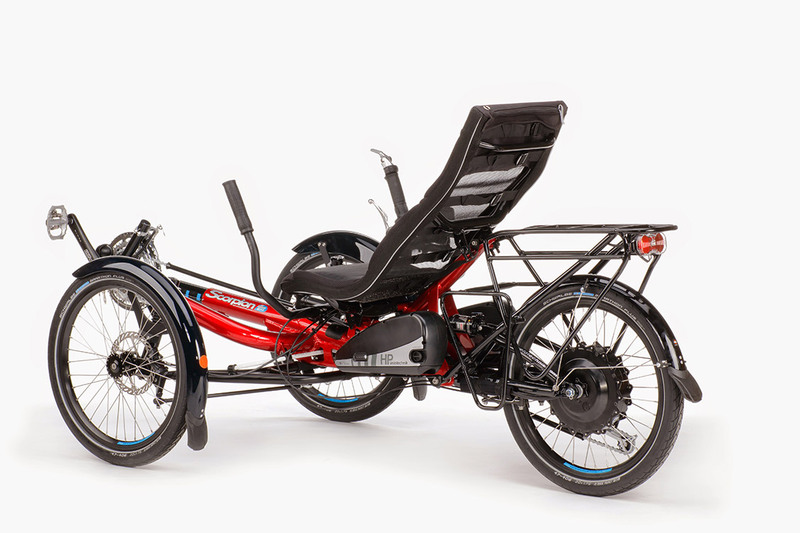 With the same small folding frame as the Internal 8 and the Base, the GT adds premium shifting, braking, and wheels for a more crisp ride and better handling. For complete specs on the Traveler click HERE and then on the "specifications" tab. The TerraTrike Sportster SL is designed to be a finely tuned, fast machine. With an already light frame, it adds premium Sram X0 shifting and Schwalbe 1.1 inch tires on Velocity Aeroheat rims to increase the acceleration. The top-of-the-line TerraTrike is an exquisite ride. For complete specs on the manufacturer's website please click HERE and then on the "specifications" tab. The Sportster brings out the athlete in all of us! 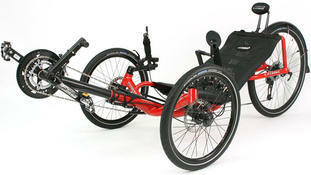 Over 20 years of experience in trike design has gone into the Sportster, and every detail has been finely scrutinized. This trike accelerates effortlessly, maintains high speeds with ease, and powers through tight corners. The lightweight aluminum frame allows the rider to move faster than you ever thought possible. The Sportster is notable for its perfect blend of performance and usability. 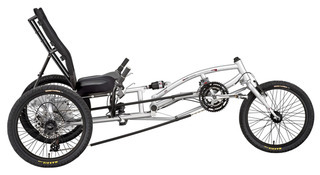 The TerraTrike Sportster Base has an Aluminum frame which makes for a lighter, sportier Trike. The shifting, braking, and other components are moderate grade, and the rider has a choice of 3 cool colors. See all the specs and information on the Sportster at the manufacturer's website HERE. 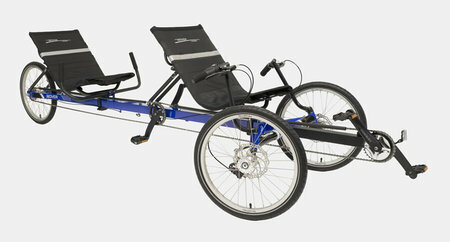 The TerraTrike Traveler Internal 8 speed, along with the Traveler Base and GT, are the smallest folding trikes we stock. In addition to folding "in half", the cross members with the front wheels also fold in and the seat is removed. With internal gears, this unit is perfect for transporting on vacation and anywhere extreme portability is required. It is a rock-solid unit that sports its nimbleness in every ride! For complete specs on the Traveler please click HERE and then on the specs button. 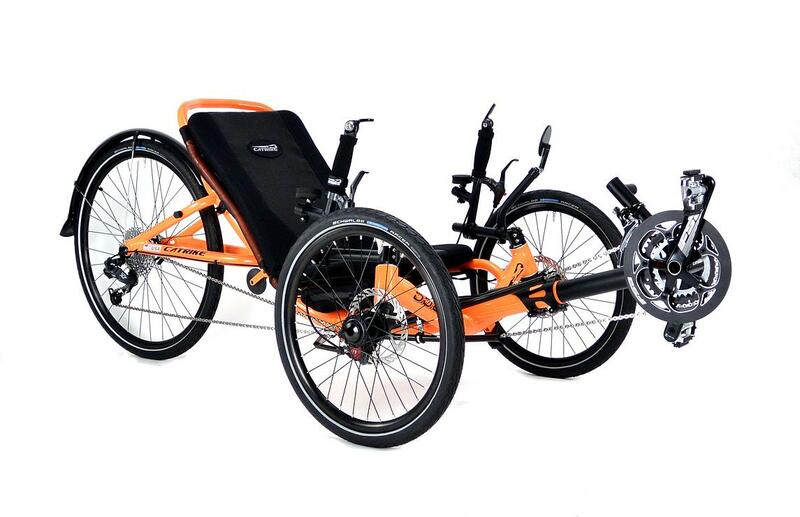 The TerraTrike Traveler Base folding Trike has a 24 gear shifting system that will both climb almost any hill as well as zip along at a comfortable speed. Like all the Traveler models, it folds into the smallest package of any Trike we stock. Folks from around 5 feet tall to over 6 feet, 6 inches can be comfortable riding. For complete specs on the Traveler click HERE and then on the "specifications" tab. 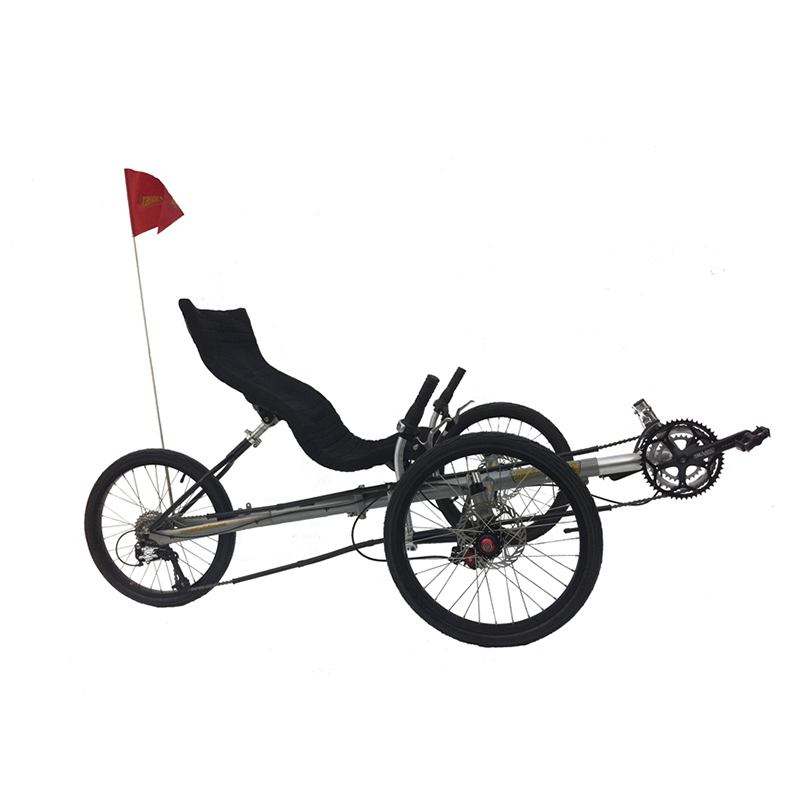 The Trailmate Joyrider allows the easiest entry of all Trikes on the market as one side of the frame is completely open. We stock the 3-speed version as it allows an easier time going up hills. The seat adjustment allows a fit for folks from about 4 feet 2 inches to about 6 feet 8 inches. It also comes with a rear basket for easy transportation of groceries or other items. For complete specs please click HERE to go to the manufacturer's website. 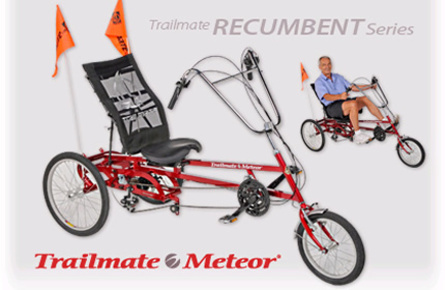 The Trailmate Meteor is a very comfortable Recumbent Trike. It fits riders from 4 feet to 6 feet 8 inches tall. Its 21 speeds allow one to climb steep hills as well as scoot down the trail at higher speeds. With the backrest, you can ride for hours in comfort. For all the options and specs please see the manufacturer's website HERE. 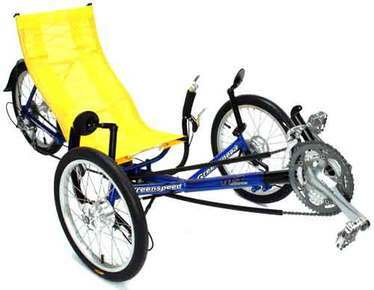 The Trident Chameleon is the top Tandem Trike that we stock. It features independent pedaling as standard equipment, and it adds a third disc brake on the rear wheel. Additionally, it sports a Sram Dual Drive rear hub that multiplies the shifting system to a whopping 81 speeds in order to be able to pedal slowly up the hills and speed faster than most on the flat and down the hills. It converts to a single Trike if you want to ride without your partner. For full specs, click HERE. The Trident Spike 2 has all the same specifications as the Spike 1, but it adds gearing that will allow the rider to climb steeper hills as well as go faster on the flats and downhill without pedaling like the Roadrunner! As a plus, remember that all the Tridents fold. See all the specs and data on the Spike 2 on the manufacturer's website HERE. 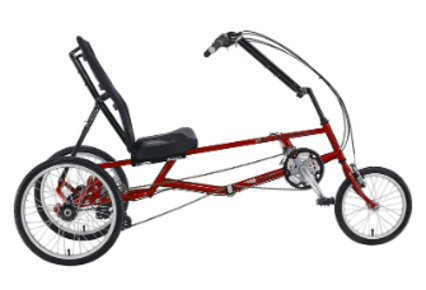 The Trident Titan boasts a 400 lb capacity along with just a few other Trikes, and it even folds! It sports a wider seat and track for those who need a little extra width. The handlebars sit like a standard upright mountain bike or hybrid, and the shifters are trigger style, too. For complete specs from the manufacturer, click HERE. 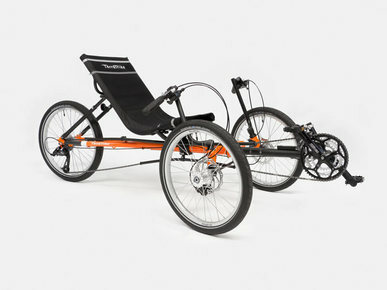 The Worksman Personal Activity Vehicle (PAV) Stretch 3 Speed is 8" longer than the standard model, and it is designed for riders who are either taller or are more portly than those who fit the standard model. It has the same generous weight capacity at 550 lbs, and it can carry multiple bags of groceries in the large basket. For complete specs on the manufacturer's website please click HERE.